Our popular candle and soap products are hand-delivered by Mike and Jess right from their home in Bridgeview! Their products are made with 100% pure, therapeutic grade essential oils. Why does that make a difference? Essential oils have been used for centuries to treat numerous ailments and for their uplifting effects on the mind and spirit. They aren't overpowering or irritating like artificial fragrance oils. All of the benefits of the essential oils come through in our soaps and other products. 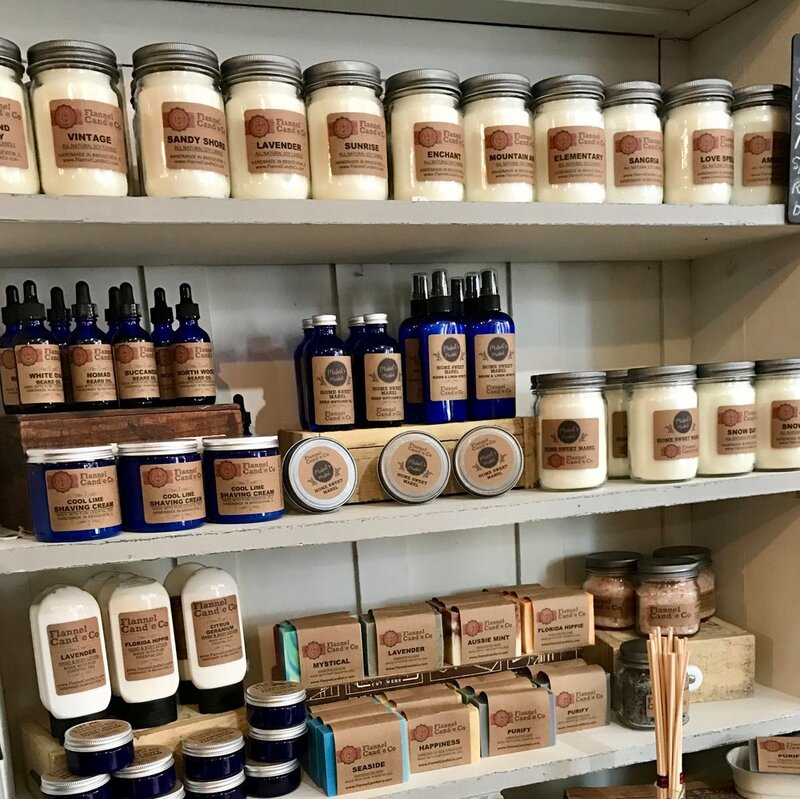 Creator of our famous “Home Sweet Mabel” blend, you’ll always Flannel Candle Co,’s inspiring selection of candles, soaps, lotions, beard care, and more at Mabel’s Market. If you’ve been to one of our Furniture Painting classes, you’ve met our instructor Debbie who you may have heard say “Im the daughter of a painter who didnt have any sons….so he taught me everything he knew” She has been painting for decades...walls, stencils, fabric, furniture...you name it. Debbie has not only contributed many of the beautiful pieces you’ve seen at Mabel’s Market, she has shared her vast knowledge in a fun and unassuming way during our classes. There is not much she can’t create, so if you’re looking for a custom piece...we usually rope her in. Do not be surprised if you are at Mabel’s Market and see Lori quietly walk in saying she has a couple things to drop off. Next thing you know, a stack of gorgeous signs, a few impressive pieces of lovely painted furniture, a Cubs “W” and a few other surprises will be lined up. Humble as can be, Lori’s graceful presence can be found in everything she adds to the shop. With over 5 years experience, mother and daughter duo, Joan and Jessica, make up our ‘pallet girls.” Maker of pallet signs, special orders and more, these girls do it all; including host our fun and creative Paint Your Pallet classes. There isnt much they havent ‘put on a pallet’ from silly saying to meaningful scripture. The Tasty Pallet uses handmade pallet signs, reclaimed wood and custom stencils to make their one-of-a-kind creations often with a lot of smiles and few jokes in between. Amy is an artist, illustrator, and mom of three living and working just southwest of Chicago. A former elementary art teacher, she left teaching in 2010 to venture into motherhood, and soon after launched the studio known as Amy Heitman Illustration | Paper | Design. After primarily focusing on custom design and illustration for several years, she launched her first greeting card line in January of 2015.She is continuously inspired by the intricate details of creation, along with the beauty and simplicity of the everyday. Each of her designs begins as a detailed hand drawn illustration before being digitally colored and printed in the USA on the highest quality fine cardstock. When we say most everything in our shop in locally-made, people often do not believe our gorgeous upholstered work and custom totes are included. Granddaughter of a talented seamstress, Dawn contributes wonderful one-of-a-kind quality, creative and functional pieces to Mabel’s Market, often using a combination of re-purposed, found and new materials. We are always thrilled when she announces she has something new to bring in as we never know what to expect, but know it will be fabulous. 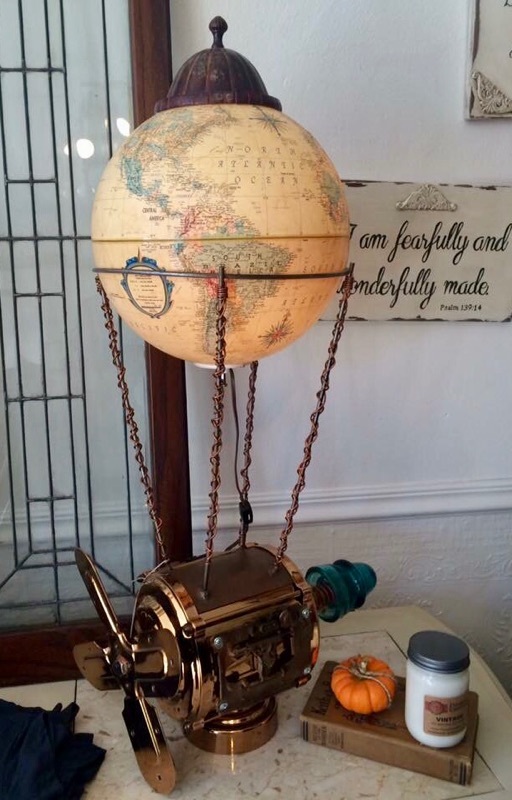 Gabriel Galvan, maker of our many unique, re-purposed lamps and decor, can truly make “something out of nothing,” Creative, thoughtful and inspiring, Gabriel’s eye-catching pieces add just the right amount of steampunk and industrial flair to Mabel’s Market. Mabel’s Market was lucky to find That Old Blue House made right in Peoria. Lisa’s jewelry is a great fit in style and philosophy to our customers. Truly hand-made and one of a kind, plus her story is kind of cool. Lisa took a Stained Glass class over 20 years ago and began making Stained Glass suncatchers and window pieces for family & friends. Through the years her work evolved and she started incorporating quilt pieces and lace (a few of our favorite things too) into her Stained Glass windows. Since she loves vintage paper, fiber, film and whatnots, she began to combine these vintage findings with her Stained Glass craft. She started making jewelry so she could experience the art on a smaller scale and enjoy the immediate gratification of finishing a project more quickly. Her gorgeous jewelry is perfect for everyday, special occasions and a truly wonderful gift! Jen at Laughing Frog Studio in Batavia is a true Mabel herself. With a background in antiques and Marketing and Communication, she understands all parts of this fun and creative business. We’ve been having fun with LFS and her upcycled jewelry since we opened. Jen and Matt make "lemonade out of lemons" or "trash into treasure.” Everything is upcycled from vintage items. The primary medium is silverplate silverware, but at times they work with stainless steel, costume jewelry, bottle caps, beads, buttons, etc. The goal is to make something wonderful out of a castaway item! Find their inspiring and unique necklaces, bracelets, rings and more at Mabel’s! Nine Arrow Designs brings a necessary pop of fun and color to Mabel's Market! Sign and decor makers, Rich and Sherry Hogan began their handiwork 30 years ago after being inspired at a craft show. All it took was a garage full of tools, paint, lumber and the inspiration of their nine kids (hence their name) and they were on their way! All of their signs are handmade and painted...no vinyl, stencil or silk screening! And brought right to Mabel's from their home in Oak Forest.